What a busy start to the week here with an early trip to town to express post an order, and consequently do the week's grocery shop earlier in the day than usual too. I cast off this shawl last night in anticipation of being able to wear it out today and was quite excited to drape it around my shoulders this morning. It's a small shawl, so it functions more like a scarf. I'll tell you all about it when I write a blog post just for it. At the moment it's sitting on the dining room table, pinned to a towel and feeling rather damp after a good spray with water. It's being blocked - and I'm afraid my blocking gets as complicated as a towel and some sewing pins! 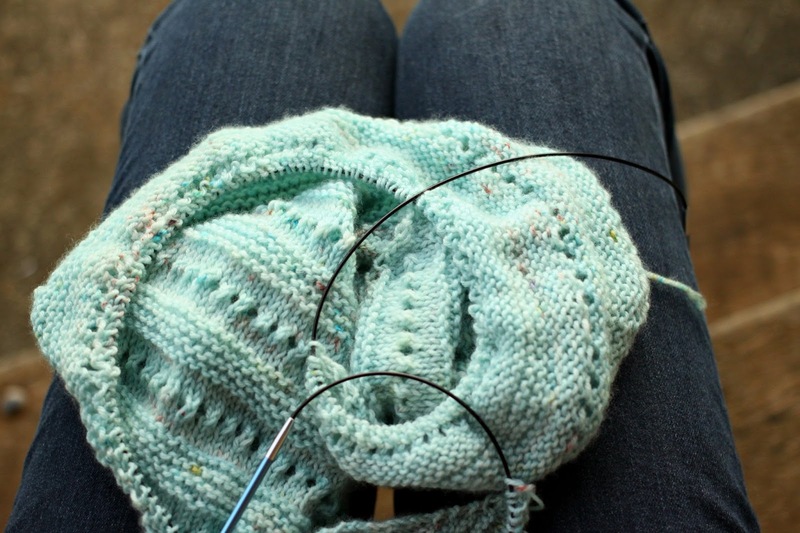 I didn't want to photograph it before blocking, even though I've already worn it out. A little contradictory, isn't it? Along with knitting, I have set myself a spinning challenge. I've been barely touching my wheel, which is no way to learn, and my lovely friend who is also teaching me to spin emailed me on the weekend and told me I must spin for 2 hours a day. At first, I thought it was completely impossible, but I am always up for a challenge and realised it probably is possible if I try super-duper hard at it. Spinning for 2 hours a day with no deadline in sight (and thus having to spin 2 hours a day forever more), makes it very hard to keep at it though, so I decided to do it for 100 days, and to keep me on track with that I've joined the 100 Day Goal. Today I've almost managed to spin for 2 hours, and as a result, the bobbins are looking rather full. If I keep spinning like this my stash of beautiful roving I was gifted for my birthday will have disappeared in no time. Hopefully, my yarn will have improved too. Rilla makes an excellent spinning companion, as I spin outside on the verandah she is happy to lie nearby and gaze out at the happenings of the bush around us. She's an avid bird watcher and gets quite obsessed with them - to be expected, I suppose, when a Border Collie no longer has a flock of sheep to chase. Bambi, on the other hand, finds it all very tedious and if I don't pat her or throw a toy she asks to retire inside to the lounge chair instead, to which she is told a firm "no!". There's no saying this challenge shall be easy, of course, but now that I've set my mind to it, told a few friends and written about it here, well, I must do it! I wonder what kind of yarn the next 100 days shall bring? I do so enjoy reading your blog! Good luck with your 100 days of spinning --- I am trying to commit myself to some hand quilting every day but it won't be for two hours a day --- I admire your determination! Happy spinning Sarah, such a beautiful companion you have there! Welcome to Say! Little Hen. This blog is written by me, Sarah, from my home in New South Wales, Australia. I'm the lucky owner of an online yarn boutique and as wool is a huge part of my life it's a big part of this blog, too. 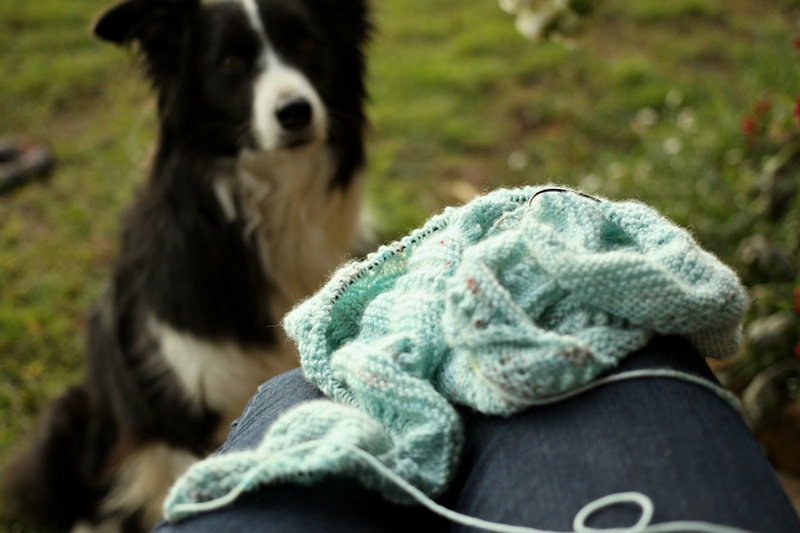 Alongside knitting, you'll also find posts about sourdough and gardening, and lots of photos. I hope you enjoy reading along, to make sure you can find here again subscribe, and if you're after more info do check out this page. 2018 Christmas Ornament Swap - Come Join! All content on this site, including text and images, are my original work and is copyright Sarah Price & Say! Little Hen, all rights reserved. It is prohibited to republish any of my content or images without prior obtaining my permission in writing. If you do wish to share, quote or reprint, please don't hesitate to contact me, I usually say yes.